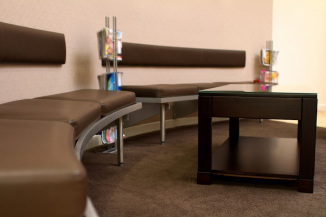 At Dr. Tillmanns' we are pleased to offer modern convenience in our spacious waiting room. Whether you are here for your first consultation or visit us regularly for hygiene appointments, you will be greeted by friendly staff and experience a warm and comfortable environment. Restoring your natural smile and investing in your oral health are our top priorities! Our office consists of six spacious operatories, all outfitted with digital radiography and monitors for patient viewing and education. 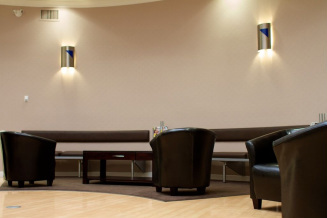 Three of our treatment rooms can provide nitrous oxide sedation for patients, while our main surgical suite is equipped for nurse-assisted IV sedation. In our three hygiene rooms, patients can relax during their cleanings and enjoy the luxury of a ceiling mounted television. It is our goal to blend comfort with technology in order to best serve our patients. Our state-of-the-art Sirona Sidexis XG Galileos 3D Cone Beam System x-ray machine provides patients low radiation dosage with extremely detailed 3-dimensional imaging, which we use routinely for complex and advanced diagnosing. With only several offices in northern B.C. using this technology, it is a significant benefit for our patients and referring dentists in the area that Dr. Tillmanns' has the capacity to use 3-D imaging for x-rays.